You saw the beginning sketch of this journal page earlier this week. 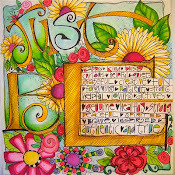 Here is the completed piece,"Just Be..."
I had such fun painting my own, i made another one for my good friend Jen, who owns a new toy company, called Zwirlz. The bright colores stars and bead gel bling, it fit her energy just perfectly! Been totally absorbed in the journal doodles, and decided to manipulate my art a little, on my Mac. ...and got this print in black and white!!!!! ...it's not a photocopy, it's a newly defined altered image! I love it! It had as a different feel than the original page. This is how i started to color the print, partially finished of course! Love that I can print (color) my image over and over again, play with color stories, use different markers, pens, pencils and paints, etc. Happy dance! Here's another one.....you've seen this journal art piece before. Love how it transformed. Now what else can it become?? Here is the new banner i made for this blog. Now i have to figure out how to display it. How long do you think that will take me?? Sometimes we are so busy planning, scheduling, tasking and juggling, that we forget about "right NOW". The very moment that is NOW, right this second as you read this is what makes up your life moments. So take a deep breath, and appreciate all the "right nows", because that's what you have, and it really is plenty. Here's a dream day, three artists visit paint factory! Yesterday i went with my very talented art friends, Chris Pallace and Kevin Serwacki (the Benches On Parade "master artists" extraordinaire, they painted 27 benches!!). It was a beautiful drive, and we arrived in New Berlin, NY at Golden Artist Colors (GAC)! It was a thrill to meet Mark Golden, the owner, who started GAC in 1980 with his dad Sam. What an inspiring and rich family history. Mark was so kind, gracious, and clearly passionate about artists and his products. We enjoyed the time he took to chat with us about our Benches on Parade (of which we used tons of Golden paints) and our artwork. Our tour guide for the whole day was Mike Townsend, the Golden products Tech Support guy. If you ever have any questions or concerns about anything Golden makes, Mike's the man. He knows everything, and takes really good care of everyone! Here we are at their "Art Bar", where at the end of the tour we were able to learn and play with some great Golden products that Mike demonstrated. We were delighted to also meet the inspiring "Golden Goddess", who is the patroness of paint, the ever constant watch over the paint bar! She is a vision. Mike had her make our magic paint here, LOL!! The "Art Bar" was inside the company store, every inch bursting with every single product that Golden makes!! Took your breath away, a cause for celebration, and hyperventilation, LOL!! Real artists know that there is no other product like Golden, it's all like BUTTAH!!! It was a thrill to visit at Golden, everything i thought it would be and more. Thanks for inviting us, we will continue to color the world with GAC! Having a ball constantly figuring out fun ways to share my art and journal pages on my blog and Facebook. My original idea for this blog wast to post inspirational art works on a regular basis, daily, weekly, etc. I call them "Whimspirations" © joanne sharpe.... It's my bright and colorful whimsical art ("whim") paired with hand lettered inspirational words, or quotes ("spirations"). Thus the clever title for a product line. Recently i was cleaning my (messy disaster) of a studio and came across a stack of my notebooks and idea journals. Flipping through the pages I saw the title "Whimspirations" and realized that i have been developing this collection since 2003! I am a huge fan of a lovely artist named Brenda Pinnick. 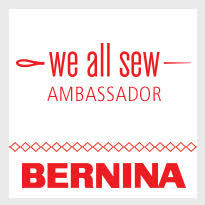 A very successful licensing artist, Brenda has a fresh colorful style that speaks to me. She is working on an art branding seminar for CHA, and she got me to thinking...what is my "brand" as an artist? 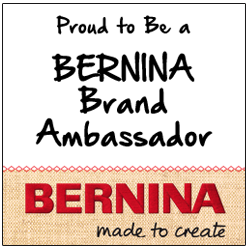 It will take me a little time to clearly define my "brand" statement, and i'd like to work on that. But i do know that i'm driven to create fresh, vibrant hand drawn art, embellished with my custom hand lettered font. 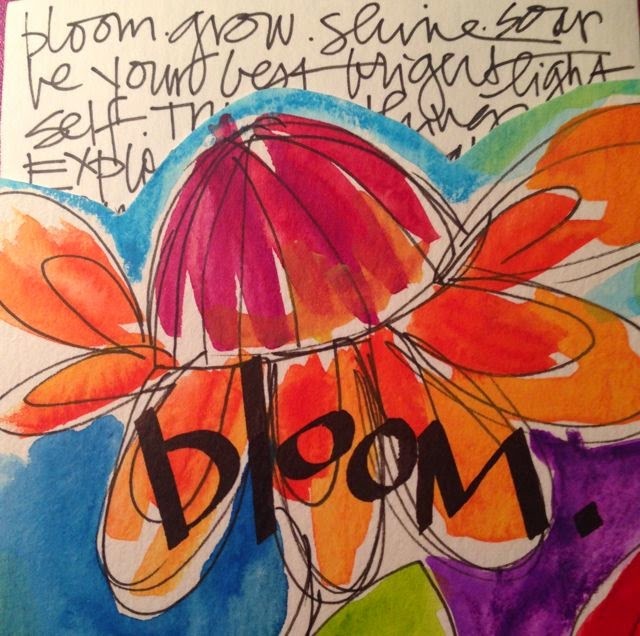 I create to "speak visually" through color and verse. I'm still not that computer savvy when it comes to creating art on the computer. Although,I'm excited to take my components and see what i CAN create. You're invited to Be "whimspired" on this blog....so check in often when you seek some good art food! These days, i am finding it soothing devouring my blank books and journals, filling them with doodling, words, flowers, borders, inspirational quotes and blather. Currently, i'm designing a program of classes and workshops that celebrate the "Creativity of Coloring"....a sophisticated, artful approach, exploring simple drawing/doodling techniques, lettering, embellishments, color, Copic markers, Golden paints, papers, tools, and inspirations. Here are some samples for the workshops. The embellishments are Tim Holtz "Tattered Florals" Sizzix dies, a ton of Ranger Glossy Accents and a few pounds of Stickles. (***I showed this book to Tim this past weekend when i took his class. I think he was a little surprised to see his designs interpreted this way! As my fellow Ranger U alum, Jennifer McGuire says, the "Skittles Palette") I just love COLOR! Live life out loud in color!! ...how could i not post about CANAL DAYS!!!!! Love love love, peddling art on Main Street! Come on down see us at Canal Days. Some fun new looks for my signs, new classes and summer camps, we gotta whole lot of ARTSY going on!! Uh, no my cats won't be there, they just wanted me to show you how artsy they are with all their spots! We'll be debuting our "CATS and DAWGS" corner in our booth....how cute are these??? We're taking my famous signs up a few notches.... (did you know that these are now sold in shops in 47 states, including Alaska and Hawaii??!!) We have SOME REALLY PRETTY NEW PALETTES and NEW GIFTY, THEMED CATEGORIES such as "FUN STUFF", "CATS and DAWGS", "WINEABLES", "GRADUATES", "GIRLFRIENDS", "INSPIRATIONS", "TEACHER GIFTS"......and lots of BLANKS FOR FREE PERSONALIZING (think kids rooms, babies, grandkids, teachers, etc)! Can you see the bling on these?? Love. You have to come see! It has been quite an honor, and a privilege to paint, create and exhibit my artwork in the Benches On Parade adventure. Click on the link you can see where ALL the benches are located and keep up on all the happenings. The VIP reception in May was magical! The folks at Dixon Scwabl did an amazing job creating a benches preview "gallery"......an empty industrial warehouse transformed into a colorful whimsical park, complete with trees, benches, pathways, oh and wine! A great party!! We were some of the last people to leave! Thank you to the paparazzi photographer, my husband Tom Sharpe, for the great photos he took for me, of all the benches, and candids at this event. I am so grateful for all the support he gives me, as my greatest art cheerleader! MY VISIT ROCHESTER BENCH "Make Yourself at Home": Now located on East Avenue, Rochester in front of the Reidman building. ...and last but not least, my WBEE BENCH "FLAT TERRY": Now located in Marketplace Mall. A great homage to my dear sweet friend Terry Clifford of WBEE Morning Club. ...and the beautiful REAL TERRY on FLAT TERRY! I just love her! This project was such great fun. It was pure joy to share these creations with my sponsors, my family and friends and now the community. Thanks to Dixon Schwabl for this project, the creative visionaries that gave the project life. So proud to be a part of this adventure.